Atlanta Families’ Awards for Excellence in Education (AFAEE) surprised educator Toni Bailey of Druid Hills Middle School as well as educators from Atlanta Public Schools, Cobb County Schools, DeKalb County Schools, Fulton County Schools, and Gwinnett County over the past two days for their work in improving student achievement, student self-esteem and collaborating with community stakeholders. Each of the 10 award winners received a prize of $7,500 that includes funds for innovative classroom projects ($3,500), professional development ($1,500) and personal stipends ($2,500). AFAEE has recognized 138 educators since its inception in 2005. 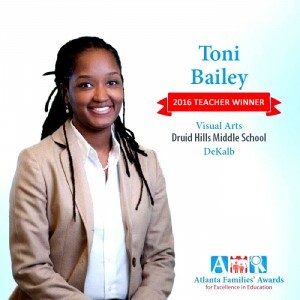 The announcement was a complete surprise for Toni Bailey. AFAEE worked quietly with DeKalb County School District and Druid Hills MS staff to throw a surprise party for the winner. Toni Bailey was celebrated with balloons, over-sized checks, gifts for their students, and special mascots and guests. The 2016 winners will be celebrated formally on Nov. 3, 2016 with an awards ceremony at The Carter Center. To find out more information about the event, visit atlantafamilies.org. To learn more about how to join the mission of the Atlanta Families’ Awards or to nominate an excellent educator, visit atlantafamilies.org. The Atlanta Families’ Awards for Excellence in Education (AFAEE) is a nonprofit with a mission to elevate public education by identifying excellent educators and empowering them to expand their impact.